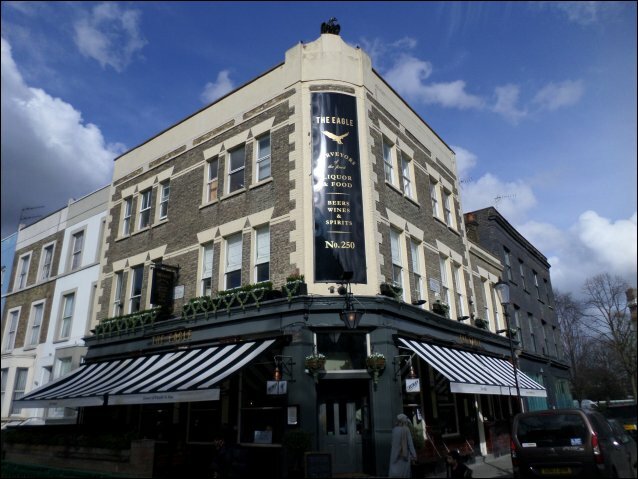 The Eagle at 250 Ladbroke Grove has changed hands again, but the good news is that it’s still a proper local pub. The new owner is Hippo Inns, a small chain with eight pubs around London. The interior of the pub has been given a fresh lick of paint and new furnishings, and there’s also the addition of two large copper beer tanks. The kitchen, formerly behind the bar, is now upstairs and a dumb waiter has been fitted. “We want our pubs to be the hub of the local community, a home away from home for our locals where food, drink and service are always exceptional,” Hippo Inns says on its website, and the newly revamped Eagle certainly has a welcoming community feel. There’s a selection of real ales – we can personally recommend the Lazarus pale ale at £4.10 a pint. It’s a Truman’s beer, and that venerable brewing name has a historical connection to the pub. The Truman brewery was founded in 1666 and when the Eagle opened in the 19th century, it was one of the first Truman-owned pubs. Truman’s went out of business in 1989 but the name and the brewing tradition was revived in 2010 – and now you can drink Truman’s ales again at the Eagle. The pub also has a tempting food menu with dishes like twice-baked Gruyère soufflé, Bavarian sausage in brioche with sauerkraut, and, if you’ve room for pudding, mulled pear and apple crumble with custard. The Eagle is one of the last traditional-style pubs in North Kensington, so it’s definitely something to be cherished. We’ve written before about the lost pubs of Golborne in this piece from 2013. Of course the phenomenon of pubs closing is nationwide, but it’s great to see one surviving, and we hope thriving, in Golborne.